Brig. Gen. Tamhra Hutchins-Frye (MA ’12) made history last year when she became the first female promoted to that rank in the Arkansas Air National Guard. Now she’ll be taking on a larger role when she assumes the duties as Director of Manpower, Personnel and Services, A1-National Guard Bureau. Since earning her MA in Human Resources Management through Webster’s Little Rock and Fort Smith locations--as well as taking online classes--Hutchins-Frye has stayed in touch as an active Webster alumna. She was instrumental in the planning phase for making Webster's growing Cybersecurity program available in Arkansas, where it will launch this fall. She helped articulate a need for this degree program in Central Arkansas and recommended potential faculty to teach in the program. Brig.Gen. Hutchins-Frye was born in Bakersfield, California. She entered the Air National Guard in November 1984 as an Airman First Class. She received her commission in August 1989 through the Academy of Military Science, Knoxville, Tennessee. She has held various assignments in the 188th Fighter Wing, Fort Smith, Arkansas, the 189th Airlift Wing, Little Rock Air Force Base, Arkansas, the Headquarters Arkansas Air National Guard and Joint Force Headquarters, Camp Joseph T. Robinson, North Little Rock, Arkansas. Brig. Gen. Hutchins-Frye also deployed in support of Operation Enduring Freedom as the Chief of Staff, North Atlantic Treaty Organization Afghanistan Transformation Task Force, Headquarters International Security Assistance Force, Kabul, Afghanistan. 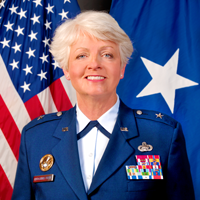 In 2016, she made Arkansas’ history when she was the first female promoted to Brigadier General in the Arkansas Air National Guard. Currently, Hutchins-Frye is the Director, Joint Staff, Joint Force Headquarters, Arkansas National Guard, located at Camp Joseph T. Robinson, North Little Rock, Arkansas. As Director Joint Staff, she is responsible for managing National Guard military and fulltime functions of the Joint Staff and joint military program operations throughout the state. She is the state’s senior federal full-time National Guard management official and serves as principal executive assistant and advisor to the Adjutant General. Before taking on this role she served as the 189th Mission Support Group Commander, Little Rock Air Force Base. Hutchins-Frye stopped by Webster’s booth at the recent National Guard Association of Arkansas Annual Conference to catch up. “We’ll miss her here, but are so proud of her many achievements,” said Kelly Lyon, director of Webster's Little Rock area campuses.